The Council on American Islamic Relations (CAIR) is a terrorist organization. Specifically, it was created in 1994 by the U.S. Muslim Brotherhood’s Palestine Committee, which is Hamas in the United States. This week’s UTT Radio Broadcast (30 mins) – which can be heard at www.WorldviewRadio.com – features an interview with UTT’s Vice President Chris Gaubatz who worked undercover at Hamas’ headquarters in Washington, D.C. (CAIR) nearly ten years ago while posing as a converted muslim. Listen to the UTT radio broadcast HERE. 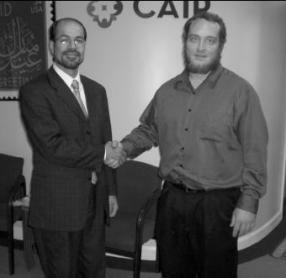 In the largest terrorism financing and Hamas trial ever successfully prosecuted in American history – US v Holy Land Foundation for Relief and Development (HLF), Dallas 2008 – which was the culmination of a 15 year FBI investigation, the FBI and the Department of Justice entered into evidence a “wide array” of testimonial and documentary evidence expressly linking CAIR to Hamas. See UTT’s CAIR is Hamas brief sheet HERE. Hamas is a designated terrorist organization per the United States government. See the Department of State’s designation of Hamas HERE. 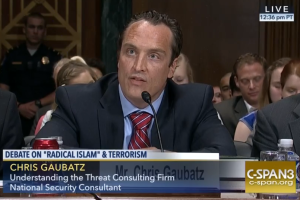 Yet, despite all the evidence from the HLF trial, the over 12,000 documents Chris Gaubatz pulled out of CAIR’s headquarters in Washington, D.C. as well as the 300 hours of covert video/audio recordings revealing CAIR is involved in fraud, sedition, and terrorism, CAIR continues to operate and CAIR leaders walk free on the streets of America. The book Muslim Mafia details Chris’ experiences and the evidence uncovered. Purchase a copy today HERE! CAIR frequently appear in the media and is defended by local and national media outlets as a “civil rights” organization. CAIR organizes “Muslim Capital Day” at state capitals around the United States, influences national policy related to the Islamic threat, attacks individuals and organizations who speak truth about the threat of Islam, and they defend jihadis (“terrorists”) while putting out the propaganda that what “terrorists” do has nothing to do with Islam. Hamas leader Nihad Awad, who is the General Masul (leader) of the U.S. Muslim Brotherhood, is now steering the MB’s accelerated efforts to prepare for war in the United States through the efforts of the US Council of Muslim Organizations (USCMO). Encourage local and state law enforcement to prosecute CAIR entities in your state. If they have no idea where to begin, please refer them to UTT. Work to ensure none of the local public entities in your area work with Hamas terrorists (dba CAIR) such as media, businesses, schools, etc. Support and defend organizations and individuals being attacked by CAIR. CAIR is a terrorist organization and should be treated as such. By Virtue of unanimous congressional consent on 15 March 1777 the 13 original American colonies became known evermore as the “United States of America” and thus entered into an ostensibly enduring friendship with each other for their common defense against any ensuing attack predicated on issues involving (among other things) religion. Yet, 225 ensuing years later, in August 2001, FBI Special Agent Harry Samit’s repeated requests both to supervisory Agent Michael Maltbie as well as (un-named) others at FBI Headquarters to authorize the issuance of a search warrant focusing on the belongings of a sharia-adherent Islamist jihadi known as “Moussaoui”, and authority to communicate with the United States Attorney regarding said subject whose possible association with Osama bin Laden he had mentioned three times in electronically transmitted narratives, all of his requests were denied, ostensibly due to bickering in Washington with respect to probable cause; which he generously characterized, presumably post 9/11, as “criminal negligence”. Notwithstanding the foregoing outrage which has led to the inevitable death spiral the country has entered as the result of Muslim Brotherhood operatives, who with the alacritous ever burgeoning assistance of a quisling dominated federal court system have embedded themselves in every element of the federal government – including the FBI and all other law-enforcement related entities, a quintet of past presidents relentlessly insist from within their multiple concentric circles of high-tech security that not only is Islam a religion of “peace”, the global Islamist Movement doesn’t even exist, I.e. “just send us the middle-east you owe us for covering-up the play-for-pay scam”. Between the words “middle-east” & “you” on the next to the last line of the OPINION I submitted on 14.05.17 @ 1413hrs, insert the words “blood money”.